Get your strawberry nutrition facts here! Why are strawberries good for you? What are the health benefits of strawberries? Find out now! Many people want to know more about how "wholesome" strawberries are. Examples of such individuals are those eating low-carb diets and vegetarian diets, people whose little ones are battling childhood obesity, and people who prefer healthy recipes. These are the kinds of people who want the food that they eat to love them as much as they love the food. The most popular strawberry dishes tend to be rather fattening, and there are certainly a lot of very sweet treats on this site. But strawberries by themselves do not pose a calorie problem for most people. So just how many calories are in strawberries? According to the United States Department of Agriculture (USDA), a typical strawberry that is 1 3/8 inches (3.5 cm) in diameter only has about 6 calories (kcal). Along with those 6 calories, each such strawberry has about .069 mg of manganese and 10.6 mg of Vitamin C, which are rather sizeable amounts. It also has 5 mcg of the phytonutrient/antioxidant lutein, which is a somewhat low value, but may still be worth noticing. 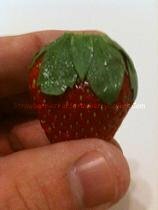 Finally, although many people think that strawberries are an excellent source of folate and potassium, the reality is that a strawberry of this size only has 4 mcg of folate and 28 mg of potassium, which is not much. The nutrient amounts given by the USDA for a cup (152 grams) of halved strawberries are 49 calories (kcal), 0.587 mg of manganese, 89.4 mg of Vitamin C, and 40 mcg of lutein (as well as 36 mcg of folate and 233 mg of potassium). More than anything else, strawberries are loaded with water. According to the University of Kentucky College of Agriculture (Cooperative Extension Service), strawberries are 92% water by volume, which is the same as watermelons (click here to open a new window with the source document). Diets loaded with high-water-content foods are commonly agreed to be useful in controlling weight, since the water helps to give a feeling of fullness. Now you know the nutritional value of strawberries. For strawberries, "nutrition facts" are items of good news! And since the dietary guidelines of almost every scientific and government group advise eating lots of fruits, we can all feel good about eating these sweet, delicious jewels we love so much! So eat more strawberries! And learn more about strawberries at StrawberriesForStrawberryLovers.Com, Home of the World's Happiest Fruit!